CARRYMAST™ is a range of lightweight, man-portable carbon fiber masts available in 9m (30 ft), 10m (34 ft), 12m (38 ft) and 15m (50 ft) standard heights. These lightweight masts are designed to be carried by one person and can be erected in the field in minutes, even under severe weather conditions. 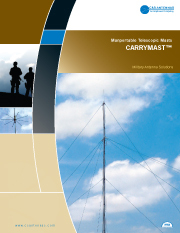 CARRYMAST™ was designed to support C&S Antennas’ range of Tactical HF Antennas Systems. An assortment of adapters and accessories are available to support UHF, VHF and microwave antennas as well. Copyright © C&S Antennas. All rights reserved.